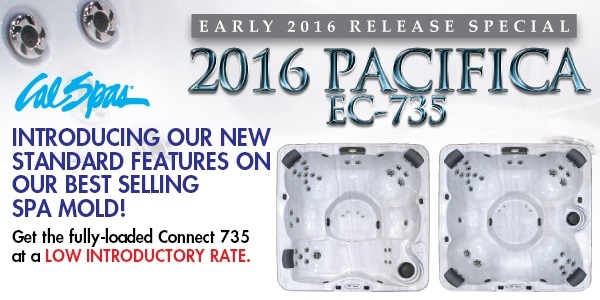 Cal Spas 2016 Connect EC-735 Spas comes fully-loaded at a special introductory price, for a very limited time! Choose between a bench or lounge configuration to suit your needs. The C735L features a lounge seat, perfect for laying back and enjoying solitary night-time soaks.Transform your backyard into your own personal spa resort with the Connect 735L. The C735B bench configuration, allows your whole family to sit together and enjoy hot tub time. With enough leg room for everyone, the bench configuration is perfect for larger parties seeking quality time with one another. Please contact your local Certified Cal Spas Dealer for additional information on this very limited time offer! Get your entire family the holiday present they can enjoy year-round with Cal Spas Connect 735 hot tub. Impress your neighbors with a night time LED water display, or play your favorite tunes from your smart device directly to the Freedom Sound System which allows you to roam around your patio controlling your music without being restricted to the length of a cord. Offer is available for a limited time, may not be combined with any other offers. Consumer financing may be available, please contact your local Certified Cal Spas Dealer for additional information.